← Rudraksha Yoga: What is the Symbolism of the Logo? 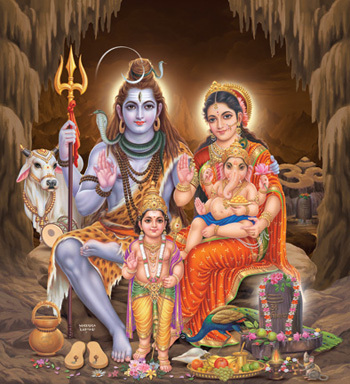 Lord Shiva and Shridevi Parvathi are one and always together. They are inseparable divine couple. They have a small and happy family with beloved sons elephant-headed Lord Ganesha and Six-faced Lord Karthikeya. You may say: well, these are very well known to everybody. What is special about these? What is the link between these deities and Kundalini Yoga? OK. Let us understand now. Meaning: Whatever is here(in microcosm), that is present elsewhere (in macrocosm) too. Whatever is not here(in microcosm), that is not present anywhere(in macrocosm)! Where do Shiva’s family members live in our body? As we discussed, Lord Ganesha controls the first psychic chakra, i.e. muladhara. He is the gate keeper and the ruler of this chakra. In passive or sleeping mode, Shridevi Parvathi also dwells here in muladhara as a serpent called Kundalini. In the awakened state, Shridevi moves as Kundalini power in sushumna. The divine channel(nadi) sushumna is nothing but Lord Karthikeya himself. The spinal column in which sushumna is said to be present, looks like a serpent. So, in Southern India , Lord Karthikeya is worshiped as a divine serpent. Since Devi Kundalini is a serpent, it also suggests that Lord Karthikeya may also symbolize Kundalini power. Lord Shiva is known to be seated in the sahasrara chakra at the crown of the head. Now, let us see the process of Kundalini Yoga. Entire yoga path starts from muladhara, the Lord Ganesha’s abode. Mother Shridevi is sleeping like a serpent Kundalini in muladhara chakra. If a person is fortunate to have the Sadguru’s Grace by Shaktipat, the Grace gently touches the divine Mother Kundalini. Now, Devi Kundalini wakes up! She enters sushumna which is the place of Lord Karthikeya. She goes up and merges with her beloved Lord Shiva at sahasrara leading to samadhi state. This union of Shiva and Kundalini Shakti(power) gives the infinite bliss to the yoga practitioner. This is all about Kundalini Yoga! Did you recognize the importance of these deities in Kunadlini yoga now? Not yet? Let us clarify it further. Muladhara chakra – Lord Ganesha is the ruler: yoga starts here. Mother Kundalini – She is Shridevi Parvathi: the means of yoga. Sushumna – Embodiment of Lord Karthikeya : the channel/path of Kundalini. Finally, Sahasrara chakra – the seat of the Greatest Lord Shiva, the Ultimate Reality: the End of yoga! This is the secret of Lord Shiva’s family and their relation with the highest yoga, i.e. Kundalini Yoga! This is still somewhat abstract. Can we understand by an analogy? Sure. Why not? 😉 Kundalini Yoga is our sacred journey. Lord Ganesha who rules the Earth element at muladhara is our origin. Lord Shiva who is abiding at Sahasrara is our destination. Lord Karthikeya is nothing but Sushumna which is the road. Divine Mother Kundalini is our vehicle and destination(because of oneness of Shiva and Shakti). The Sadguru is our guide and map. Got it now? Let us pray these deities to help us in the practice of Kundalini Yoga. By their blessings and Grace we can surely achieve the real goal of life and yoga. This entry was posted in Hindu Deities, Kundalini Yoga, Lord Shiva, Yoga and tagged bliss, chakras, ganesh, ganesha, god, grace, grace of guru, guru, guru's grace, hinduism, indian philosophy, karthikeya, kundalini, kundalini yoga, lord ganesha, lord shiva family meaning, macrocosm, meditation, microcosm, muladhara, philosophy, psychic chakras, religion, religion and spirituality, sadguru, sahasara, shakti, shiva, shiva and his family, shiva family, shiva family kundalini yoga, shiva family meaning, shridevi, spirituality, sushumna, ultimate reality, yoga. Bookmark the permalink.